It's once again the time of year when US News & World Report releases their annual rankings of undergraduate engineering programs. Congratulations Purdue ABE colleagues! 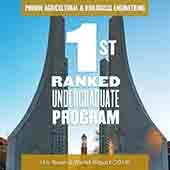 For the 8th consecutive year, our program is ranked #1. This is certainly a reflection of everyone’s (alumni, students, staff and faculty) commitment to excellence in our program. I greatly appreciate your support of our program, and especially for our undergraduate program with today’s news. It’s always great to see your dedication to our students and program recognized by peers as it is in the rankings released today. Earlier in the year, our graduate program was also ranked #1 by US News & World Report and has been in that spot for 10 of the past 11 years. A good colleague has often joked that we are fortunate that we haven’t had to submit pictures of our building and facilities as part of the rankings process. We are making progress in providing a building and facilities of the quality and quantity that a program like ours needs to continue to thrive. Check out the most recent updates on our new building at https://engineering.purdue.edu/ABE/ABE/aboutus/newbuildingforABE/Building%20Progress and watch for weekly updates at our web page. In the coming weeks, the demolition phase of the building project will end, and a shift to the construction phase of the project will occur. Purdue ABE has a bright future and thank you for being an important part of that future!